Have you ever created a landing page for your business and the result was no where near where you expected? The reality is a good landing page comes as a result of lining up a number of critical components which would be best described as putting all of the pieces of a puzzle in the right place. Hey David Judge here and today we’re going to talk about…. 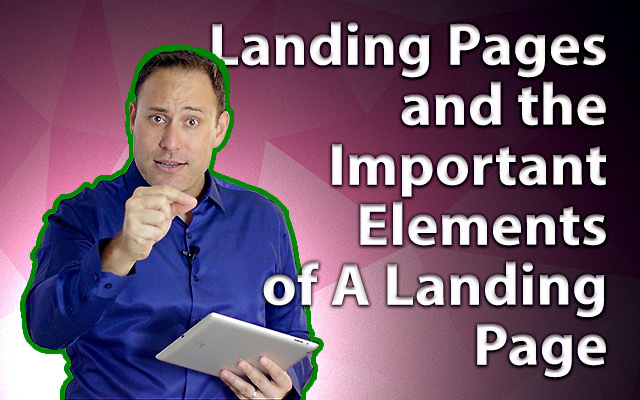 Landing Pages and we’re going to explore the purpose of a landing page along with the key elements every landing page should have. Now, before we get started and for those of you that are thinking ‘What’s a Landing Page’, let briefly jump in and explain…. Now I’m grabbing this from unbounce as I love the way they explain the idea of landing pages. Ok, as unbounce says, in the world of the online marketing a landing page is ‘standalone page that is separate from your main website’ that is designed with a single focus or objective. This also means that your landing page keeps visitors separate from your main website. The reason why this is set up this way is you want to make sure you are MAINTAINING the focus of the visitor to that action you want them to take, without allowing any distractions to get in the way. ‘Click Through’ and ‘Lead Generation’. Click through pages are designed to educate a person around the benefits of a product designed to warm a person up and to assist with their buying decision. The error a lot of businesses make when they are using ‘Paid Advertising’ to direct toward a site, is they direct visitors directly TO the product without warming them up first with all of the benefits of that product. The other type is a ‘Lead Generation’ where you capture user data like their name and email address. The SOLE purpose of this page is to get peoples contact details so you can market to and connect in the future. When you use this type of landing page you need to give them a reason to complete their details. There are other examples that can be applied to your business with this giving you a basic guide. So, why would you want to use landing pages? Landing pages are most commonly used for paid advertising and are used to increase your conversions. Lets face it, you’re paying every time a person clicks you want to maximise the possibility of getting a conversion and the ‘concept’ (as we said earlier) of a landing page is to Maintain the focus of the visitor. When I click on your ad, guess what I expect to see when I go to your landing page???? That’s right, that single offer. So if I’m clicking on a link about 101 dog stories to blow your socks off, I expect to see why 101 dog stories will have that effect as opposed to a generic home page where there are simply too many choices and distractions. Now, I invested a little time on that first pointer as this is one of the biggest gaps businesses that use landing pages miss. They have a totally different message from the ad to the landing page and if I ask for a salad I don’t want to be given a cheeseburger. (is my analogy too left wing???). So I have a little exercise for you as we finish up. Go to Google and perform a few searches and click on the paid ads related to that search and see how many businesses are following these basic principles. Every time I look I am awestruck at how many people are throwing their money away by not looking at these basic principles that are PROVEN to work!!! What that means is there is a lot and I mean a LOT of opportunity here to get the maximum result by following this simple little formula and will ensure you’re getting the maximum ‘Bang for your Buck’. In the next session we’re going to talk about The Top 5 Ways you can understand what your customer wants.